To practice queer poetics, for me, is to approach writing as a totally convivial and cannibalist act. Conviviality, as Jasbir Puar puts it, is the opposite of “resistance, oppositionality, subversion, and trangression.” While the impulse “to queer” might very well be antagonistic and disobedient to society, it ultimately emphasizes the collective and consumptive practice of living and dying-with. In this sense, the truly provocative thing about queerness is not that it speaks on behalf of a certain non-normative body, but that it enacts, appeals to, and dares to commingle and consume all bodies and things. I think queer writing bypasses the typical shortcomings of language when it adopts the cannibalistic drive of the Ouroboros: it becomes what it eats, which are the referents (or ingredients) of its words. Far from merely denoting and delimiting experience, this writing unleashes sensation. As a hunger and force, sensation is indiscriminatory and undifferentiating. It is a deviating flow that transfers itself from body to object and back again, refusing to rest. Unlike identificatory labels such as “LGBTQI” and “Boyesque”/”Gurlesque,” queer writing gets so hungry that it unravels identity by devouring and collapsing categorical opposites like woman, man, animal, insect, vegetable, commodity, and corpse. You, too, risk turning into a faceless potato through the all-consuming queer text. Because queerness, in my mind, is not limited to non-normative sexuality or humanity or any fixed subjectivity, it must take ecological and bodily instability as ground. By inhabiting states of violence, mutation, and abhumanity as the very landscape of their writing, Bhanu Kapil, Kim Hyesoon, and Raúl Zurita engage this model much more than self-identified gay writers such as Mark Doty and John Ashbery. What results is not a sublimation of the sexual instinct. It is the thermometrical scale of the cannibal instinct. Carnal at first, this instinct becomes elective and creates friendship. When it is affective, it creates love. I’m with you. “My vegetable love would grow/ vaster than empires and more slow”. I’ll begin it – Ding, dong, bell. OMG Joyelle, yes! Potato eyes will obviously be part 2 of this post. Maybe Mother Mary Potato can write it. That quote is rich. Tim, glad to see someone else join the Ouroboros fan club. It’s only a matter of time before everyone falls into such a tantalizing mouth. I absolutely love what you’re developing here, Lucas: queerness’s radical potential to transmute absolutely everything. Its ability to rhizomatically devour the code in its entirety, rather than simply inverting it. “It enacts, appeals to, and dares to commingle and consume all bodies and things.” Yes. A rad cannibalistic lineage you’re tracing, here, Lucas! I’m thinking about the difference between a hungry rhizome and an infectious rhizome… and how this commingling and consuming functions with bodies in pain / bodies with disabilities. Something exciting to unpack in there! The way you apply the convivial here might actually be quite useful for talking about gurlesque (and other feminist aesthetics!). This term is new to me through your posts, but haven’t gotten to read the Puar article yet, so must do that! 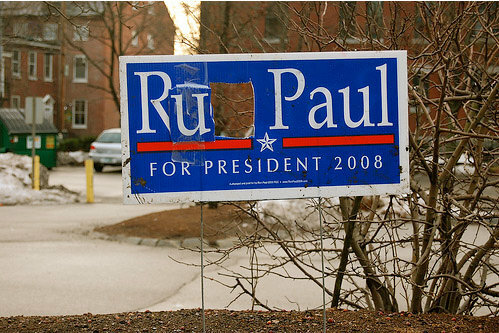 & I agree that there’s a real different trajectory for the gurlesque and the (woot!) potatoesque. I don’t think gurlesque commingles, or consumes bodies. There are feminist aesthetics that do that, and I don’t really care for them because they often resort to really essentialist readings of femaleness. Tricky territory for me! I want to ask, is the cannibal different when your speaker is cultured to produce more bodies in her body? & then not supposed to eat them when they come out? & then they devour your body from your non/orifices? & I want to ask that without essentializing the bio-mother-body, but by liberating the aesthetic and circumstantial weirdness of reproduction from that notion of universal motherbody. I also want to keep in mind the different lived experience of bodies that are called on to perform in all these different fashions. I don’t know! My snakes are running loose! Maybe Mother Mary Potato can help us! It might be useful to think about what these terms are. What we want these terms to do – describe, incite, read? To me the gurlesque was never about identity, never meant you had to be a woman to write it. And, I never saw the gurlesque as being a movement or following specific rules (I never thought that it had to be written by female poets). I saw it as a term that identified and called attention to certain aesthetic sensibilities that had been brewing all over the place, including certainly many of the poets I consider the best/most interesting poets alive (Kim Hyesoon, Aase Berg, Chelsea Minnis etc) – poets interested in theatricality, violence, gothic/grotesque, trash and artifice. And importantly, artists in other genre (Kara Walker, Nathalie Djurberg, some of the “lowbrow” art etc). Yes, Johannes, I’m with you in all that you say. Gurleseque, for me, is a provisional term that describes, as you say, something that’s been happening all over the place (in multiple media) for some time now. It describes a mode of performance, which (to my mind) can be performed by anyone. Some people have argued against this, saying that the most important thing about the Gurlesque is the subject position “gurl.” Valid as it this claim may be, that’s not my line. It’s not about adhering to identity markers. It’s about cannibalizing and skewing them. But then again, I’m about as non-essentialist as they come. I don’t actually believe in boys and girls. I would say that Ito is potatoesque in her queering of maternity. Her mothering is not just birthing and rearing but also killing and eating; it is an unmappable, unbridled, bodily force that nevertheless undermines the “universal motherbody,” as you eloquently put it. Your comments do make me want to revisit écriture feminine (which I think you’re referring to) as another possible predecessor; Cixous, especially, wrote porous, feral books that I love. Mary and I should have more to say about disability and able-bodiedness, as per Puar. Johannes and Lara, as I hope you know by now, I’m very much a fan of the Gurlesque and its destabilization of identity. Perhaps we see ourselves as pushing this destabilization in different directions, even and especially those that turn the poet into the love, electricity, and vulnerability of a starchy vegetable. Potato soil inevitably calls for different aesthetic aims and sensibilities than the ones you’ve listed, Johannes, so we’ll get to that too. To me, art should be a stimulant, a producer of strange new sensations, as opposed to being a way of representing some sort of experience that we think of as static, as being rounded and completed. Also, sensation, as your quote suggests, is anonymous. A pain or pleasure might be “mine” and yet it is also not-mine, it’s in the world, it’s a vibration that seems both completely animal and completely spectral. Like a piece of meat picking up an odd frequency from the air. Maybe the anonymous quality of sensation might somehow relate to the non-essentialists notions of art Lara and Johannes have brought up. Writing itself becomes masked & anonymous, and the artwork becomes simply a space in which sensations are created/unleashed/invented…To quote the famous like by Beckett: What matters who’s speaking? I like queer as a Napoleon-Bonaparte poetics. But labels ARE queer. Walmart’s a label and it has everything. I also like how you separate “queer” poets from queer poets. It’s exclusionary. Are gays gonna start to banish gays if they’re not potato enough? What are the consequences of attaching “queer” to heterosexual poets? Would someone call a white poet black or a black poet white? I’m totally down with most of what you say about sensation–I remember your excellent post about Grosz–except I do think it matters who’s speaking, or which assemblages have implicated the writer’s body. In this sense I don’t see the writer’s body as masked and anonymous; rather, it’s so personal and intimate that it intensifies contact, commingling bodies precisely by unleashing affect beyond but also, simultaneously, through specificity. If I’m not making much sense, my posts on the death drop, Tori Amos/the piglet and Zurita/Fever Ray try to get at this dynamic which, as you say, operates as that weird zone of “mine” and “not-mine,” of identity as the aperture to nonidentity. Our version of queerness is not about homonationalist Napoleonic empire but a thousand tiny, hungry, revolting sexes. As I hope you realize despite your conflations, Walmart is a homogenizing empire. It leaves no room for my feathery mutations. In other words, the potatoesque is against exclusion. One consequence of expanding the idea of queerness is to complicate the narratives by which gay, white, neoliberal subjects uphold their exceptionalism. Queer writing does not confuse constructs such as blackness and whiteness that have real, material differences; instead, it foregrounds those differences in all the ways they’re embodied. Hiromi Ito–perfect! Kim Hyesoon and her baby-eating rats, too. Action Books bringing the cannibalistic mama. NB’s a mutant. He was neither a Capet nor a Frenchman. He was a peasant-like Corsican who transformed himself into emperor b/c of a thousand, tiny, hungry schemes. The imperialists goal of uniformity inevitably produces the opposite result. Once NB left the countries, the citizens inevitably revolted. There was no order. There was chaos. Walmart may be one label. But within the label there’s numerous and diverse treasures. When I shop at Walmart, I can buy Snickers, clothes, DVDs, a bicycle, toilet paper. My options are not restricted to one type of product. In this single space, there’s millions of things to consume.